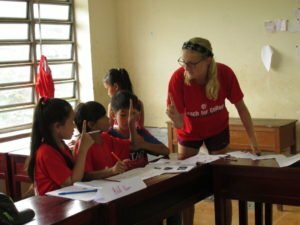 Our fourth conversation is with Allie Klimkiewicz ’19, a member of the Princeton women’s track & field team who traveled to the Vị Thủy District of Vietnam. I was extremely excited to be selected for the CFC program and wasn’t quite sure what to expect going to Vietnam. I had a few guesses, but as I have come to learn my abstract perceptions were far from the reality that I experienced in the Vị Thủy District of Vietnam. What amazed me the most in regards to the language barrier was how much we could communicate with hand signals, especially while coaching sports. In class, I relied quite a lot on our Vietnamese counterparts to help disseminate the lesson. However, the basketball court was a whole different story. While coaching basketball, hand motions allowed me to communicate with my students to show them how to correctly dribble, shoot and pass. At times during basketball I even forgot that the language barrier was there. Although shy at first, many of our students came out of their shells quickly. There are so many positive adjectives I could use to describe our students but the main ones that come to mind are energetic, loving, funny and hardworking. During class many of them were quick to volunteer and during basketball the kids would cheer their classmates on relentlessly or participate in the games with a ton of energy. Most days I would wake up around 5am to run with a few of the other American coaches, eat breakfast and be at the school by 7am. We taught 7th grade in the morning and 6th grade in the afternoon. Each school session consisted of 4 lessons that was a combination of a school subject (I taught biology), a sport (I was a basketball coach) and a life skill. We ate all our meals family style at the guesthouse where we lived and took a bus to get the school about 10 minutes away. Practically every night we met with the other coaches to lesson plan and then hung out together in one of the rooms. A great memory I have of the trip was on the third day of school when the inevitable rain (it was rainy season during our stay) poured down during our afternoon school session. Instead of everyone cowering inside, the entire school ran outside to the soccer field and played in the mud as the rain drenched us all. Some of the kids got hold of buckets and were filling them up with the muddy water to throw onto the coaches. The entire time I couldn’t help but smile with disbelief that I was having so much fun and it was only the first week of school. The funniest memory that comes to mind is probably the night that Nguyen, one of the Vietnamese directors, showed up at my room after dinner. Nguyen said that she had brought my roommates and I starfruit as gift and that she really wanted us to try it. On the count of three we all tried it and immediately realized that we had been tricked by Nguyen since she had picked out a sour starfruit for us. Nevertheless, we made sure to eat the whole thing even though we could barely eat it from both the sour taste and how hard we were laughing. One of the coaches, Jake, said during the final days of the program that he hoped to “Come home and be the man that our students thought he was” and I go forward from this program striving to achieve a similar goal each day. Participating in Coach for College has made me more aware of the many privileges in both opportunity and circumstance we have living in America. However, this opportunity has also made me appreciate the beauty of other cultures that are such a contrast to America. Definitely get to know the Vietnamese coaches just as well as you get to know the American coaches. The Vietnamese coaches are some of the kindest people I have ever met in my entire life and are so interesting to talk to. I look forward to keeping in touch with many of them and am so grateful to have gotten the chance to meet them through this program.